After studying the arguments and facts, I’ve now come to realize the existence of HFTs is unlawful and is a direct threat to the fairness and stability of financial markets, far outweighing any so-called benefits. Michael Lewis’ new book “Flash Boys” only confirms these facts. LIE #1: HFTs offer greater transparency in the stock market and provide market liquidity. By posting phony bids and offers on stocks exchanges (NasdaqGM:QQQ), HFTs are able to extract information from real buyers and sellers to use as an unfair advantage for themselves. The only financial transparency that HFTs create is for their own illegal self-interests. WATCH: Are Chinese Stocks Really a Bargain? 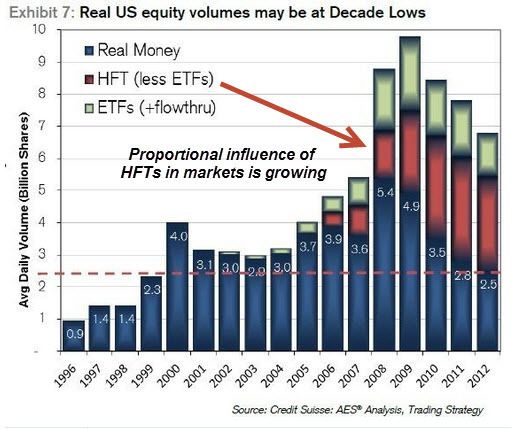 What about HFTs providing market liquidity? This is standard propaganda often promoted by the very stock exchanges that cater to HFTs. Some academic literature, usually paid for by the colluders, promotes the liquidity fairy tale too. The sole existence of HFTs is to steal and cheat with their illegitimate edge over other stock market participants. Whatever market liquidity HFTs seemingly create, is purely incidental to their other dishonest activities, which take priority. LIE #2: HFTs have reduced the cost of trading and investing for the greater good. Never mind how HFTs have bid up the cost of data feeds coming from major stock exchanges like the NYSE and Nasdaq (NasdaqGS:NDAQ). At the height of the 1999 boom in Internet stocks, the number of price quotes surged to 1.3 million to 4 million a day with trading volume sometimes flirting with 2 billion shares in a single day. During the first three months of 2014, the average number of daily stock quotes skyrocketed to between 125 and 176 million per day on average trading volume of two billion shares per day, according to Nanex Research. That’s 100 times more price quotes on virtually the same trading volume as 1999! Today, HFT firms have more than 1,000 complex order types at their disposal and they are purposely clogging up the system. This has added a pointless layer of complexity to financial markets, thereby raising the cost of data processing and market regulation. LIE #3: HFTs have lowered the risk in financial markets. This illusion is illustrated by the “Flash Crash” of May 6, 2010 when the Dow Jones Industrial Average (NYSEARCA:DIA) suddenly crashed 1,000 points and mysteriously recovered within just a few minutes. Who were the culprits? Computer provoked volatility has created unnecessary chaos to the point of destabilizing global financial markets to the determinant of everyone. This is particularly true if the chaos occurs during the last 30 minutes of the daily session when circuit breakers are not active. LIE #4: Securities regulators were and are unaware of illicit HFT trading. If the Securities and Exchange Commission (SEC) was completely ignorant of illicit HFT trading, that would partially absolve them. Is that the case? As this quote shows, even low-level SEC staffers acknowledged the existence of HFTs, which is a sure sign that high-level SEC officials knew about it too. Even worse, how the SEC has and continues to protect HFTs instead of protecting the investing public. What happened to the fair and orderly markets the SEC is supposed to uphold? The HFT scandal is a classic example of the domino effect: Rogue HFTs have been blessed by rogue stock exchanges who in turn have been blessed by rogue regulators. None of this was supposed to happen. The SEC’s adoption of Regulation FD (fair disclosure) doesn’t just apply to how publicly traded companies disseminate information, but it also extends to how major stock exchanges – and anybody with nonpublic material information – should operate. 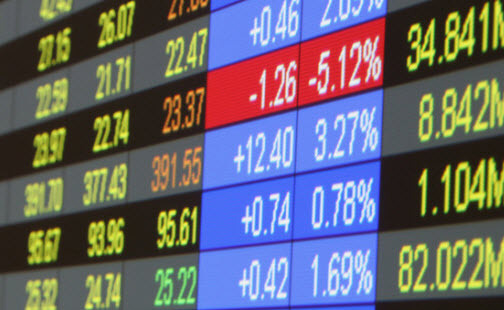 Business Wire said on Feb.14 it would no longer allow HFT firms to license direct feeds. Good for them. Until major stock exchanges (NYSEARCA:VOO) take concrete steps to stop the unfair and unlawful dissemination of big data to their HFT colluders, I believe they will remain in violation of Reg. FD. Whether the SEC will choose to enforce its own rules, is another matter. The ETF Profit Strategy Newsletter diffuses financial propaganda and keeps investors on the right side of the market. Do Regulators Encourage Market Manipulation? Arthur Levitt’s nonchalant attitude toward high frequency trading firms is symbolic of the SEC’s ongoing failure to properly regulate and police the stock market. Bernie Madoff’s multi-billion dollar scam was happening when Arthur Levitt was serving as an SEC Chairman. If some gets information quicker just because they pay for that and use it to for i.e. remove orders (because they are seeing incoming orders from other) – that is fraud! An easy way to punish HTF is to increase tick sizes. I am pretty sure that liquidity will be better with increased tick size.